Institute's Aaron McEneff moves to North London this summer as he hopes to take his first steps to Premiership stardom after earning a two year scholarship with giants Tottenham Hotspur. 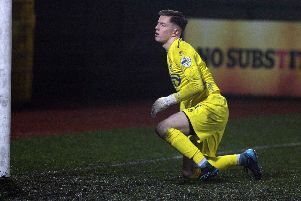 INSTITUTE starlet Aaron McEneff is joining Premiership giants Tottenham Hotspur this summer, Sentinel Sport can reveal. The gifted midfielder, who earlier in the year had a trial with Scottish Premier Division side Kilmarnock, is signing a two year scholarship deal with Harry Redknapp’s side following a successful display at White Hart Lane. In fact former England international and now Spurs Technical Co-ordinator Tim Sherwood, felt McEneff reminded him of a ‘young Roy Keane’, after he watched him during a training session. The St Columbs College student concedes he’s over the moon about his move to North London. “I was offered a two year scholarship with Spurs and I’m buzzing,” admitted the 16-year-old. “I went over a few months ago and took part in a few training sessions but they wanted me back to play in a match and I played against Aston Villa a few weeks ago. “I think that is when Tim Sherwood said something about me reminding him of a ‘young Roy Keane’, which was nice to hear but a bit crazy,” said the Manchester United supporter. The level headed Northern Ireland U17 international although thrilled about his summer move isn’t taking his eye off his studies and is concentrating on his forthcoming exams before aiming to try and hit the big time at White Hart Lane. “Yes I can’t wait to make the move across to London, but before that I have to make sure that I get my GCSE’s first and then start thinking about Spurs. “My first target whenever I go over to London is to try and do well in the Spurs Under 18 side under Alex Inglethorpe and then hopefully progress into the Academy under John McDermott and then see what happens. ’Stute’s Head of Development Paul Kee is thrilled McEneff is getting his move across the water. “Aaron is a great lad both on and off the pitch and he certainly has the right mentality to make it, but he knows that the hard work starts now. All of McEneff’s old sides Institute, Maiden City Academy and Don Boscos are expected to benefit financially with the move to Spurs.